In November, the Pet Industry set several dubious records. 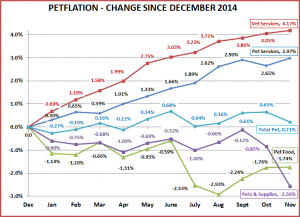 The Consumer Price Index for the Pets & Supplies Segment fell 1.72%. This is the biggest November drop on record, edging out 2009, during the recession. Add this to the 0.73% drop in October and Supply Prices fell 2.44% in two months. This is an all-time record for any 2 month period by a big margin…29%. The previous “leader” was Oct-Nov 2009, which marked the beginning of the ongoing deflationary period in this segment. Year To Date: Down ↓-1.74%…Still big! Year To Date: Up ↑0.21% – Still on track for a moderate annual increase. Here’s a “visual” on the first 11 months of 2015 for all segments and Total Pet. What strikes me most about the chart is the relatively calm movement of the Total Pet Pricing in 2015 which “masks” the underlying turmoil in the segments. The Service Segments basically just go up. After a big drop in January, the Food and Supply segments were also relatively calm until the second half when both literally “fell off a cliff” with record drops. Here’s an updated status and “best case” projection for the total year. 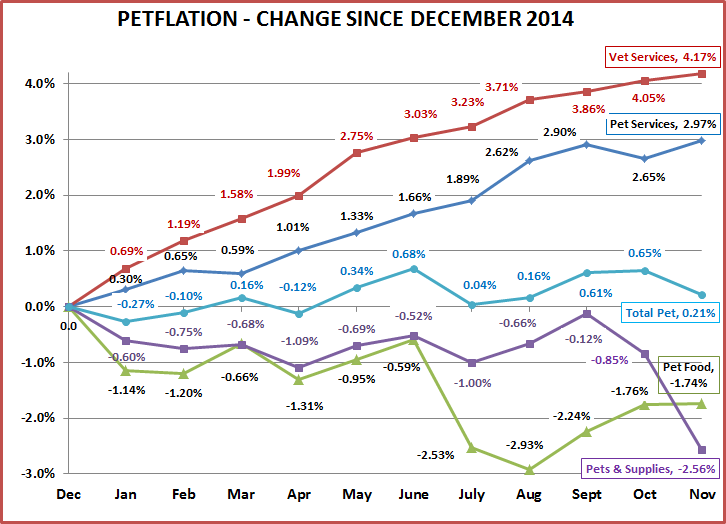 Veterinary Services – Prices continue to inflate at a high rate. We’ll see what impact this has on 2015 consumer expenditures. The inflation in 2014 helped push sales to a record level but the increase was primarily limited to the higher income households. Lower income groups decreased spending by $1B. Non-Vet Services – Although inflation is less than the Veterinary Segment, it has started to slow the increase in consumer spending. Income (over $120K) and need (age 65+) are big drivers in this segment. 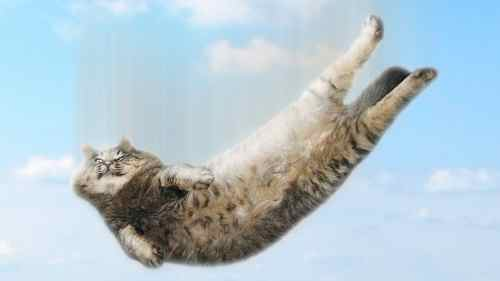 Pet Food – Pet Food prices have only deflated in 3 years since 1997. They will fall in 2015 for the second year in a row, the third time since the recession and the drop in the CPI will be about 3 times as large as the previous worst plunge. Things have changed in this segment. Since the recession, the consumer is more value driven, less brand motivated and better informed. Couple this with the increased availability of improved quality products in nearly 200,000 outlets plus the internet…and you get an extraordinarily competitive environment. Remember that food is a “need” product group. Lower prices do not drive consumers to buy “more”. They just spend less. Pet Supplies – For most of the year, it appeared that the Supply segment was moving out of the deflationary slide which began in 2009. However, the record Fall plunge probably spoiled that. 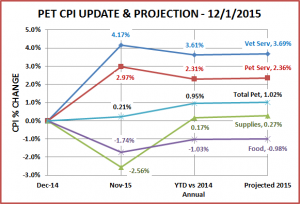 If 2015 mimics 2009, then December prices should increase slightly, if not…. Major categories in this segment have become commoditized, driving down prices. Innovation is the key to reversing this trend. Make it functionally better and consumers are willing to pay more. If not, then retail price is their focus. Total Pet – Projecting a moderate 1.02% increase. 2 Negative situations have combined to produce at least the appearance of a positive. What we have seen in the Pet CPI is a powerful argument for looking beneath the surface of all data. 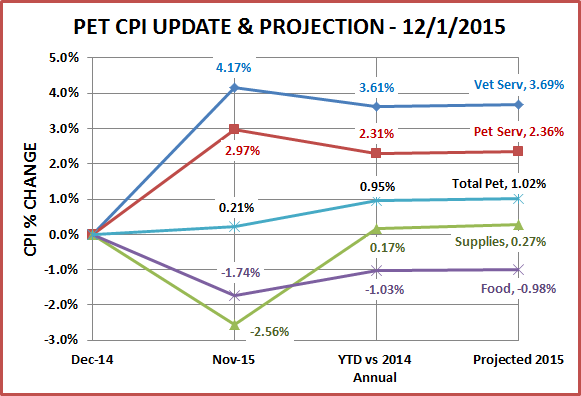 When December’s numbers are published, we’ll do a detailed annual CPI review.